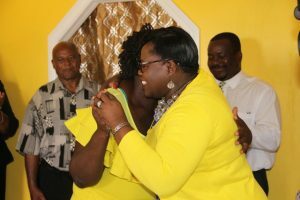 NIA CHARLESTOWN NEVIS (October 23, 2017) — Single mother of seven, Ms. Stephanie Freeman, is the recipient of a new three-bedroom home at New River Housing Project. The gift is part of the Ministry of Social Development in the Nevis Island Administration’s (NIA) Community Housing Assistance Programme. Moments after she was presented with the keys on October 19, 2017, by Hon. 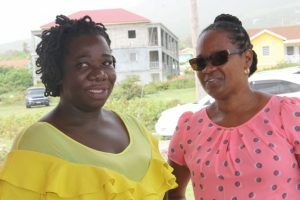 Hazel Brandy-Williams, Junior Minister in the Ministry of Social Development on Nevis, Ms. Freeman thanked the minister and her staff profusely for the assistance given to her and her family. “I would like to say thanks to the Social Development especially Minister Hazel Brandy. She always been behind me and I would also like to say a big, big thanks to Kim Sing. She has always been there for me and not letting me give up. 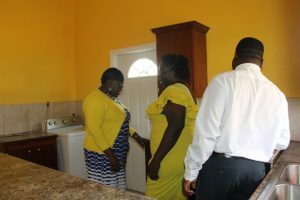 The new three-bedroom home of Stephanie Freeman gifted to her and her seven children on October 19, 2017, by the Ministry of Social Development as part of its Community Home Assistance programme to assist the poor and most vulnerable on Nevis. “I would like to say thanks to everyone who [has] been there for me, [and have] been supporting me. Thanks to one and all,” she said. In her remarks, Mrs. Brandy-Williams stated that the Department of Social Development was made aware of Stephanie’s plight through Mrs. Kim Sing, Social Case Worker in the Department of Social Development. They realised that her situation was dire, given that she had seven children, all under the age of 16 at the time and immediate intervention was paramount. The minister said in every situation where children are involved, the ministry does not hesitate to assist because the welfare of children is priority. She said, housing is a fundamental right to every human being and it was fitting to assist Ms. Freeman with housing under the Community Housing Assistance Programme. Ms. Stephanie Freeman (middle) showing Hon. Hazel-Brandy Williams, Junior Minister of Social Development in the Nevis Island Administration and Mr. Keith Glasgow, Permanent Secretary in the Ministry the kitchen area of her new home presented to her on October 19, 2017, under the Ministry of Social Development’s Community Home Assistance Programme. A visibly elated Mrs. Brandy-Williams, added that she was pleased with Ms. Freeman, a graduate of the department’s Restore Inspire Secure and Empower (RISE) programme, was able to pay for the plot of land on which the house is constructed. She referred to the accomplishment as a major one and believes, it stems from the empowerment in a programme designed to replace the social welfare programme which existed for many years before. “At the end of this programme, we would want everybody to graduate from this public service hand out and are able to stand on their own and rise as the programme indicates. We want them to rise and so, today I am very happy. “I am very proud of Stephanie for her accomplishments up to today and she could only continue to build on the foundation that we have given her. I am certain that it is very challenging having to parent seven children on her own but with her determination, I am certain that she will get it done and get it done quite successfully,” she said. The Minister, expressed hope that Ms. Freemen would continue to make the property her home, castle and mansion and urged her to ensure that her children took care for it. She also expressed satisfaction. “I am happy that you are now living in your own home and so you will continue to grow and develop as a person. This is my true admonition to you,” she said. 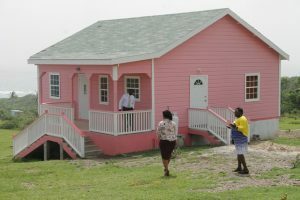 Minister Brandy-Williams, also expressed gratitude to private contractor Kevin Jeffers and his team who built the house. She explained that on occasion, the Ministry sub-contracts private builders because of limited maintenance workers at the department and the volume of work to be done. Other remarks came from Mr. Keith Glasgow, Permanent Secretary in the Ministry of Social Development and Mrs. Kim Sing, Social Case Worker in the Department of Social Development, Bishop Stephen Liburd delivered the blessing while Mrs. Shelly Liburd, who oversees community housing assistance projects, chaired the proceedings. Also present at the handing over ceremony was Ms. Michelle Liburd, Assistant Secretary in the Ministry of Social Development.